Thunderstorms can cause your canine extreme and unnecessary anxiety. Your dog doesn’t have to go through this anymore thanks to the Storm Defender cape! Tom Critzer was desperate to help his dog, Cody, overcome his storm phobia. Cody's reaction to thunderstorms would begin before there were outward signs of a storm or heat lightning. If he was inside the house, Cody would pant, pace, continually bark and claw at wallpaper in fear. Once while outside during a storm, Cody panicked and ripped through the canvas on a camper. Tom, with degrees in psychology and electrical engineering, began to research. He came across a theory that the static charge before and during thunderstorms was the trigger that upset dogs. He developed a cape with a special metallic lining that discharges the dog's fur and shields him from the static charge buildup. 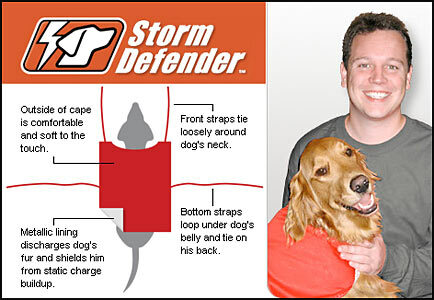 His patented invention, the Storm Defender cape, has since helped hundreds of dogs. To date, over 1000 Storm Defender capes have been sold with an over 95% success and customer satisfaction rate. Since Tom's untimely death in February, 2005, his three children have continued the family business. Static electricity that builds before and during a thunderstorm can cause your canine anxiety, but thanks to the Storm Defender, your dog doesn’t have to go through this anymore! When properly used, the Storm Defender cape will reduce the dog's anxiety. The cape has a special metallic lining that discharges a dog's fur and shields him from the static charge buildup reducing his sensitivity to the charge. The dog gets relief, and after a few storms begins to learn that the secondary triggers like rain, wind, thunder, barometric pressure and smells are no longer to be feared. With the cape on, the dog feels as though he has found a safe place. The electrical activity is only loosely related to rain. We can have charge without rain such as "heat lightning" or rain without charge such as "April showers." Since humans are largely insensitive to this charge, we must take our cues from the dog. It is very difficult to calm a dog once they have reached full panic, so promptness is essential. How Do I Use The Storm Defender Cape? The Storm Defender cape gives relief to dogs that are excessively afraid of thunderstorms. It must be put on when the dog first begins to get agitated due to an oncoming electrical thunderstorm. The cape reduces the dog's sensitivity to the static charge that precedes and accompanies a thunderstorm. It may be removed when the electrical activity has passed. The cape is for indoor use only. Some learning is involved. The maximum efficiency is reached after the dog has experienced two or three thunderstorms with the cape on. Timing is crucial! The cape must be put on before the dog has reached high agitation, which may or may not coincide with rain. 1. Put the cape on when the dog first notices something. 2. Learning is involved. If you usually give your dog drugs during storms, consult your vet. Certain drugs may make the learning process more difficult. 3. If your dog has separation anxiety, do not put the cape on and leave. Can The Storm Defender Be Washed? Yes, although the inner layer is delicate so please wash gently by hand, and hang dry. My Dog Is In Between Sizes, Which One Should I Order? We encourage you to use your best judgment based on your dog's body type. Remember we can always exchange it for you if you feel you ordered the wrong size. Does The Storm Defender Work For Fireworks? The Storm Defender is primarily designed to work for storm anxiety. However, in some cases it seems as though the fear of noise is a learned secondary response. If the cape helps the dog for storms, it's possible their fear of noise will also diminish. Yes, if you are unhappy with the Storm Defender in anyway, simply send it back to us for a refund. Absolutely! If you are a vet or pet store is interested in purchasing the Storm Defender wholesale please contact us to get started. What Do Customers Say About The Storm Defender Cape? I have definitely referred others to buy the product and wished I hadn't waited so long to get it. I had heard about it a year ago but waited because I wasn’t sure it would work. I must say we were amazed and most importantly grateful that it did. Dixie is happier and we are happier for it. Even after only 3 storms it is clear to me that the cape is 100% successful for George. It has totally exceeded my expectations and made life a lot less stressful for both George and I. Thank you, thank you, thank you. I recently purchased a "cape" for my 10-year-old chocolate lab. What we went through for the past 10 years was terrible. "Tanqueray" would shake, her teeth would chatter and she was destructive during thunderstorms. I would never put her on medication or try anything until I came upon your "Cape". I tried it the first time and couldn't believe it. It calmed her down to where she laid down as soon as I put it on. We love it and couldn't be without it now. Thank You! Order Your Storm Defender Cape Today! Thunderstorms can provoke a great deal of anxiety in your dog, but it doesn’t have to! Thanks to the Storm Defender cape, the static electricity produced before and during a thunderstorm will no longer trigger the alarm response in your pet. We are so confident in our product that we back it up with a money back guarantee! So what are you waiting for? Don’t let your pet go through another storm without the Storm Defender!